Wiki Loves Monuments in South Africa took off with a bang some days ago, with a grand opening in Cape Town, the “Mother City”. Wiki Loves Monuments went global in 2012, and that doesn’t just include the Western world. The competition includes several African countries: Ghana, Kenya and South Africa. While preparing for the South African event, the team quickly noticed that there were some cultural and practical differences between last year’s participating countries and South Africa, and that the organisation would not be an easy task. 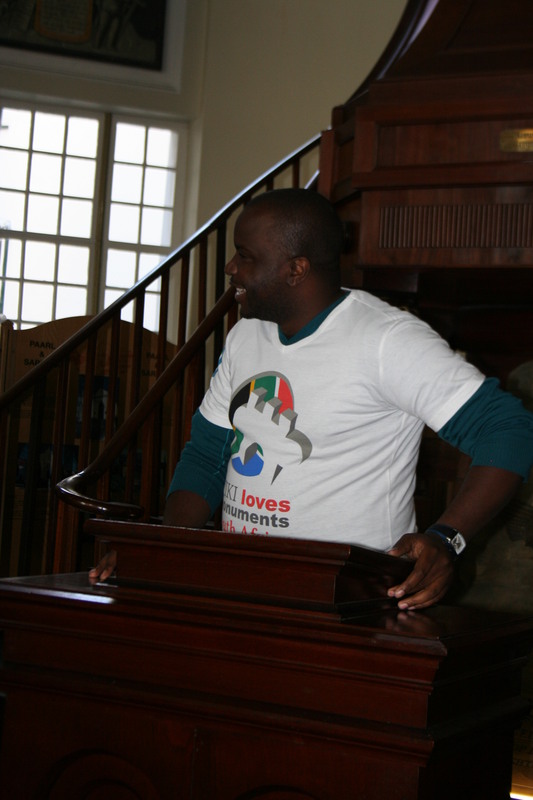 Dumisani explains the competition during the Launch Event in the Sendinggestig Museum in Long Street, Cape Town. Author: Douglas Ian Scott. One difference is the lack of volunteering culture. In order to convince all enthusiasts, the WLM South Africa team decided to start the competition with a launch event. It was organised in Cape Town, a city with important history and a place where heritage sites are widespread. About 30 enthusiasts gathered at the gates of the Castle of Good Hope for a guided tour specially organised for Wikipedians. Our guide constantly reminded them to take pictures and upload them to “wikiwikiwiki“. Afterwards, the event continued at the Sendiggestig Museum, a heritage site in Long Street, where we explained the history and goals of the competition, and gave a photo upload demonstrations for the participants. A second important focus for the contest are the different cultures and languages of South Africa. These communities often don’t have an easy access to photo cameras or to the Internet; smartphones with a data plan are much more common. That’s why we are very happy we can approach them with our Android app. We also allow those communities to nominate new monument sites. The existing monument database is skewed in favour of the colonial times; the new nominations are welcomed by the governmental organisations to get a more diverse monument database.